Around our household we make it a point to eat cruciferous vegetables such as kale, cabbage (purple is our fave), broccoli, Brussels sprouts, and cauliflower virtually every day, often even during multiple meals in a single day. Among this class of nutritional stars, kale stands out as the brightest superstar. I grow some of my own kale, though the bunnies in the neighborhood often consider my garden to be their own private salad bar. Even if I can outsmart the rabbits, our household consumption of kale far outstrips my ability to keep us supplied with homegrown kale. Joan’s signature salad starts with kale. We cut the leaves off the large stems and discard the latter, then mix the leafy greens with shredded purple cabbage, cilantro, and green onion, then dress it with extra-virgin olive oil and red wine vinegar. This salad will hold up for several days in the fridge, even with dressing on it. 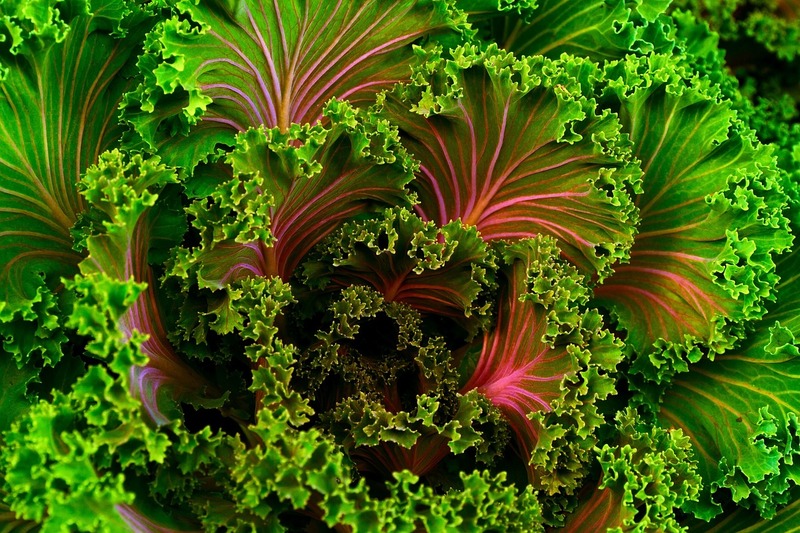 Kale and other cruciferous vegetables confer unique and potent protection against the type of DNA damage that can cause cancer. Kale in particular is loaded with natural plant-based phytochemicals that can protect us against cancer, heart disease, infections and premature aging. Sulforaphane, one of the antioxidants in cruciferous veggies, helps to detoxify your body by eliminating dangerous compounds from your system. Kale also contains anti-bacterial and anti-inflammatory compounds, in addition to stimulating the production of proteins called immunoglobulins, which are crucial for identifying and neutralizing foreign invaders such as bacteria, viruses and cancer cells. A recent study from Italy found that people who consumed cruciferous vegetables such as kale at least once weekly slashed their risk of getting cancer by up to a third, with lower rates of malignancies of the mouth and throat, esophagus, pancreas, colon, kidney and breast. In particular, sulforaphane has been shown to selectively target and eliminate precancerous and cancerous cells. A study that appeared recently in the American Journal of Clinical Nutrition reported that cruciferous vegetable intake reduced the risk of cardiovascular death by almost 25 percent. Kale is especially rich in lutein and zeaxanthin, two colorful carotenoids that seem to protect against atherosclerosis by inhibiting oxidation of the LDL (bad) cholesterol. These carotenoids will also help to keep your eyesight sharp by preventing against cataracts and macular degeneration. Vitamin K is a critically important nutrient for ensuring that the calcium you consume ends up in your bones and not in your arteries. Kale is one of the best sources of vitamin K, and olive oil you drizzle over your salad will help you to absorb the vitamin K better. Kale is also abundant in soluble fiber, which helps reduce blood levels of sugar, CRP (a marker of inflammation), and cholesterol. Also, kale is virtually calorie-free and is very low in sugar, with high levels of vegetable protein, all of which help to keep you feeling full longer. Kale is also an excellent source of vitamin C, calcium, manganese, copper and potassium. Kale is quite possibly the single best superfood on Earth. It looks like it helps to lower your risks of coming down with cancer, heart disease, and Alzheimer’s disease. And, no one has ever gotten fat eating too much kale! Develop a taste for kale and make it a habit. Recent studies show that olive oil and vinegar improve overall health and lower risks of dementia and premature death. So use this as your salad dressing.